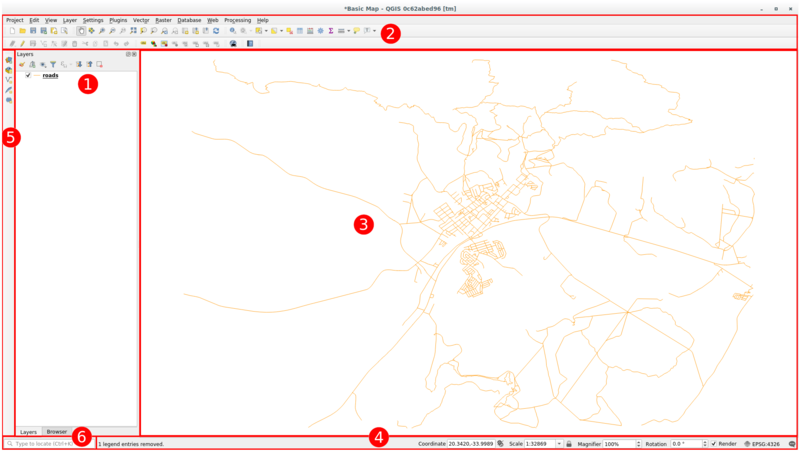 We will explore the QGIS user interface so that you are familiar with the menus, toolbars, map canvas and layers list that form the basic structure of the interface. The goal for this lesson: To understand the basics of the QGIS user interface. Hovering the layer will give you some basic information: layer name, type of geometry, coordinate reference system and the complete path of the location on your device. A vector layer is a dataset, usually of a specific kind of object, such as roads, trees, etc. A vector layer can consist of either points, lines or polygons. The QGIS Browser is a panel in QGIS that lets you easily navigate in your database. You can have access to common vector files (e.g. ESRI Shapefile or MapInfo files), databases (e.g. PostGIS, Oracle, SpatiaLite, GeoPackage or MSSQL Spatial) and WMS/WFS connections. You can also view your GRASS data. If you have saved a project, the Browser Panel will also give you quick access to all the layers stored in the same path of the project file under in the Project Home item. Moreover, you can set one or more folder as Favorites: search under your path and once you have found the folder, right click on it and click on Add as a Favorite. You should then be able to see your folder in the Favorites item. It can happen that the folders added to Favorite item have a really long name: don’t worry right-click on the path and choose Rename Favorite... to set another name. Your most often used sets of tools can be turned into toolbars for basic access. For example, the File toolbar allows you to save, load, print, and start a new project. You can easily customize the interface to see only the tools you use most often, adding or removing toolbars as necessary via the Settings ‣ Toolbars menu. Even if they are not visible in a toolbar, all of your tools will remain accessible via the menus. For example, if you remove the File toolbar (which contains the Save button), you can still save your map by clicking on the Project menu and then clicking on Save. This is where the map itself is displayed and where layers are loaded. In the map canvas you can interact with the visible layers: zoom in/out, move the map, select features and many other operations that we will deeply see in the next sections. Shows you information about the current map. Also allows you to adjust the map scale, the map rotation and see the mouse cursor’s coordinates on the map. By default the Side toolbar contains the buttons to load the layer and all the buttons to create a new layer. But remember that you can move all the toolbars wherever it is more comfortable for you. Within this bar you can access to almost all the objects of QGIS: layers, layer features, algorithms, spatial bookmarks, etc. Check all the different options in the Locator Settings section of the QGIS User Manual. With the shortcut Ctrl+K you can easily access the bar. Try to identify the four elements listed above on your own screen, without referring to the diagram above. See if you can identify their names and functions. You will become more familiar with these elements as you use them in the coming days. Try to find each of these tools on your screen. What is their purpose? If any of these tools is not visible on the screen, try enabling some toolbars that are currently hidden. Also keep in mind that if there isn’t enough space on the screen, a toolbar may be shortened by hiding some of its tools. You can see the hidden tools by clicking on the double right arrow button in any such collapsed toolbar. You can see a tooltip with the name of any tool by holding your mouse over the tool for a while. Now you’ve seen how the QGIS interface works, you can use the tools available to you and start improving on your map! This is the topic of the next lesson.